Fleeing from violence in Myanmar’s northern Rakhine State, since August 2017 more than 700,000 refugees have crossed the border to Bangladesh. Many of them have suffered severe trauma from violent attacks on their villages and families, and nearly all of them are relying on humanitarian assistance to help to meet their basic needs. 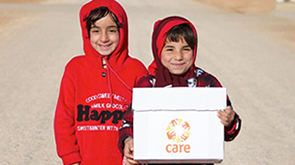 When the crisis began in August 2017, CARE, working with a local NGO partner, started immediate relief activities, including distributing food to families in need. 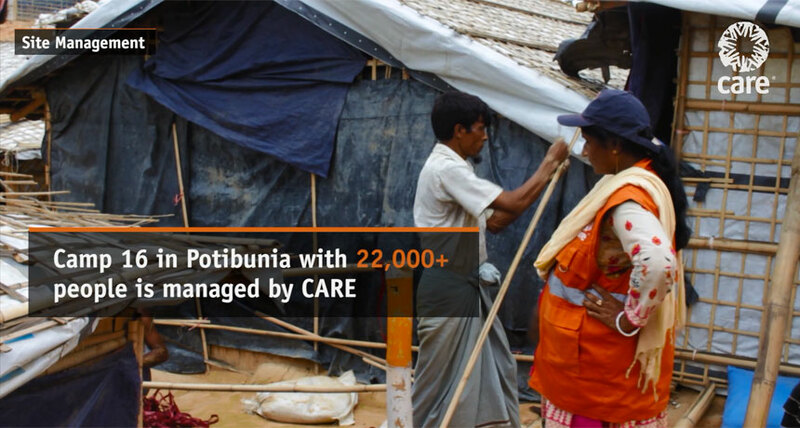 Since then, we have assisted more than 315,000 refugees through shelter and site management, health, protection from gender-based violence, and water, sanitation and hygiene support. This represents 45% of the refugee population in Cox's Bazar. 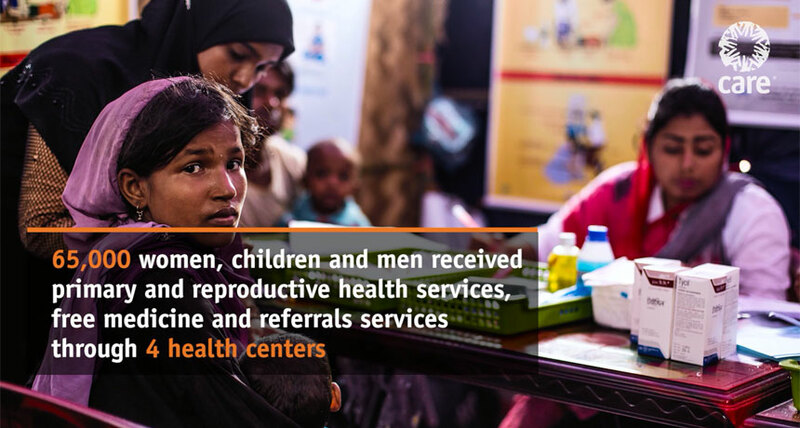 Read more in this August 2018 report by CARE Bangladesh. We have set up 5 women-friendly spaces and 2 information booths. Thanks to your support, we have already achieved a great deal. But the scale of this crisis means that much more help is needed. 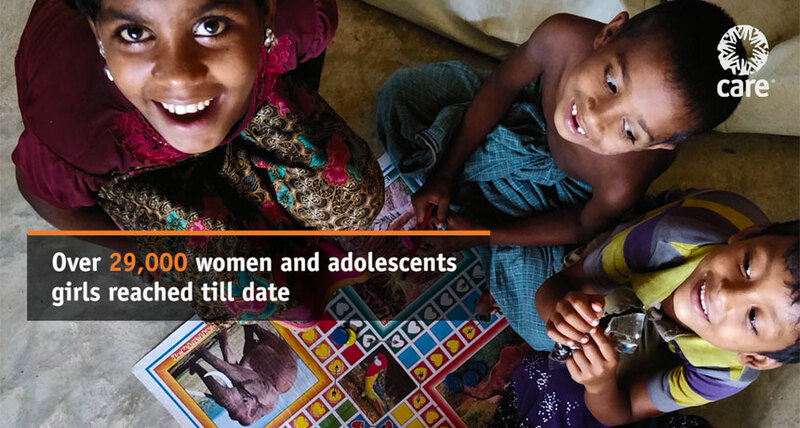 Please donate now so we can continue to help women, children and families. An escalation of violence in Myanmar’s Rakhine state in late August 2017 led to vast numbers of people fleeing across the border into Bangladesh in a desperate search for safety. Most of the refugees are women, children and small babies. More than 600,000 people are staying in host communities, existing refugee camps, new makeshift settlements or camps, or just wherever they can find space. Most are reliant on humanitarian assistance to meet their basic daily needs. More than 400,000 people require support to meet their food needs, while an estimated 125,000 pregnant and lactating women and children under 5 will need supplementary feeding. This is a massive influx of people into a relatively small area near Cox's Bazar in southeast Bangladesh. 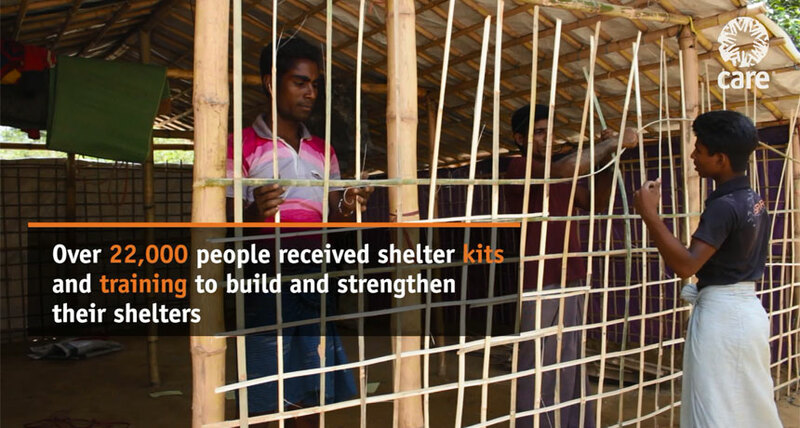 The government of Bangladesh and local authorities are working hard to meet the needs of the refugees, while local Bangladeshi families, with few resources themselves, have been assisting refugees where they can. 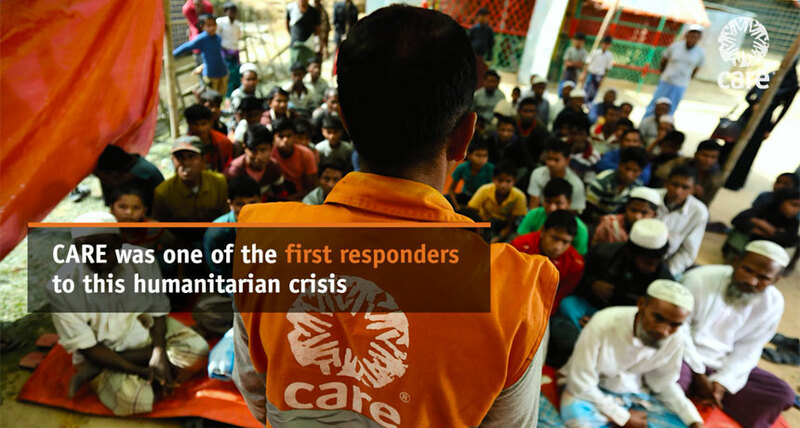 CARE has been on the ground since the early days of the crisis, and with other humanitarian agencies we are continuing to work to meet the immense level of need. 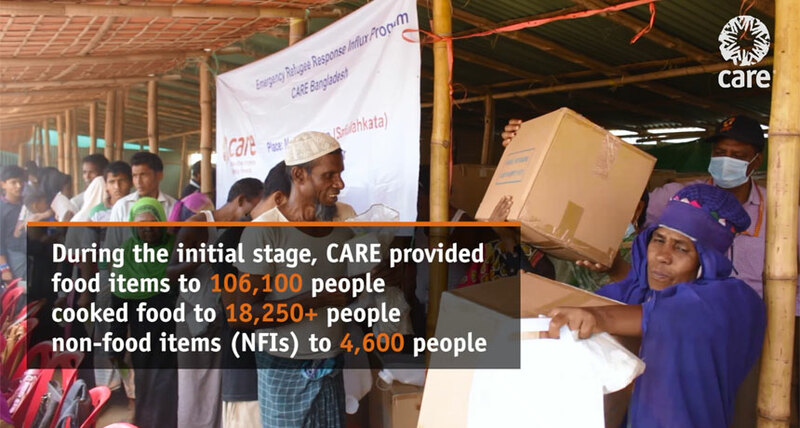 As at November 2018, CARE has directly reached over 300,000 people through the distribution of food, non-food items, health support, shelter, protection, and water and sanitation services. Our emergency response team distributed cooked meals and dry food as well as essential items that families need: candles; matches; clothes; blankets and utensils. We distributed the materials people need to build emergency shelters like tarpauins, bamboo and rope. We set up women and adolescent-friendly spaces and providing counselling and a referral service for survivors of gender-based violence. We worked with local partners to deliver community-based assessment and treatment of acute malnutrition. We are assisting with refugee camp management and the coordination of emergency responses in the refugee camps. 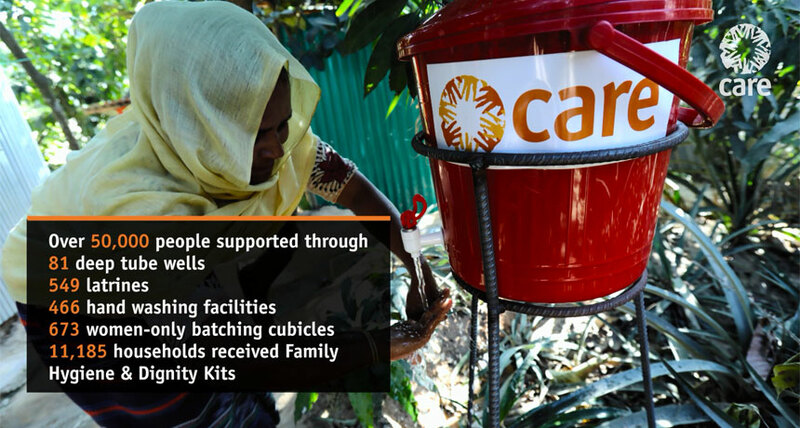 As part of a consortium, CARE is providing technical support to the community-based management of acute malnutrition project. We have also introduced a pioneering project with the local host community in Ukhiya, who have been affected by an influx of people displaced from their homes by the disaster. The project will support more than 38,000 people by improving their disaster risk resilience capacities; their WASH (water, sanitation and hygiene) situation; and their overall living conditions. Please donate and send real help now to refugee families in Bangladesh.